Lychee (Litchi chinensis L.) belongs to family Sapindaceae and cultivated in tropical and subtropical countries. The fruit is an excellent source of nutrients, i.e., vitamin C, and polyphenols, and other parts of plants, i.e., leaves and stem, have huge medicinal value and are used to cure various ailments. Litchi chinensis is facing several agronomic and horticultural problems such as susceptibility to many pathogens damaging preharvest and postharvest fruits, uneven fruit growth, short shelf life of fruits, high seed content, and high yielding variety. There is limited scope of conventional breeding techniques in improvement of lychee due to self-incompatibility, to long juvenile period, and to heterozygous nature. Biotechnology can complement conventional breeding and enhance the lychee improvement programs. Studies involving in vitro culture, screening, micropropagation, embryo rescue, genetic transformation, marker-assisted characterization and DNA fingerprinting, and QTL are underway at different centers worldwide for the improvement of lychee. In vitro culture, callus induction, cell suspension culture, and somatic embryogenesis of several different genotypes have been achieved. Protocols for protoplast culture and somatic hybridization of protoplast of lychee and longan have also been achieved. Isozyme markers and DNA markers offer means for gaining more insights in the genetics of the crops and identifying genes that could lead to accelerate lychee improvements. Genetic transformation using Agrobacterium tumefaciens and physical and chemical methods has been reported. Genes that are involved with fruit ripening, disease resistant, and enhancement of shelf life have been cloned, and there have been attempts to deliver these genes into plants. Transgenic lychee was developed by introducing the SAMDC genes from Datura stramonium responsible to increase the shelf life. Studies on genetic diversity of lychee cultivars by molecular markers are found to be effective in comparison to morphological markers. 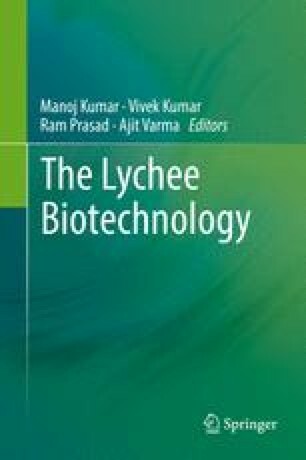 The purpose of this review is to focus upon contemporary information on biotechnological advances made in lychee by overcoming the problems encountered during in vitro propagation, generation of disease resistant, and enhanced shelf life cultivars.